Mellanox Technologies reported unprecedented packet processing performance of its NPS-400 Network Processor when using its newly released Deep Packet Inspection and Stateful Packet Processing software libraries. Mellanox said these new software libraries, coupled with the hardware acceleration capabilities of the NPS-400, enable Deep Packet Inspection processing for application recognition at record breaking processing rates of up to 400Gbps, in conjunction with handling of 100 million flows with an average packet size of 400 bytes. 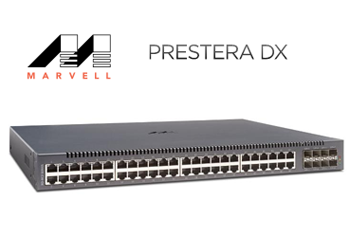 These processing capabilities could be used for Intrusion Detection Systems and Intrusion Prevention Systems and to accelerate processing capabilities for switch routers. 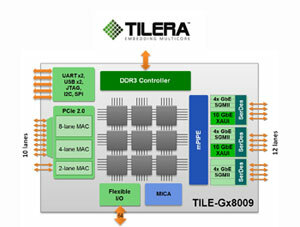 Tilera unveiled a 64-bit 9-core processor targeted at applications in networking, multimedia, storage and general purpose computing. The TILE-Gx9 integrates a high-performance memory controller, Ethernet and PCI Express interfaces, and available crypto and compression engines to reduce both system cost and circuit board area. 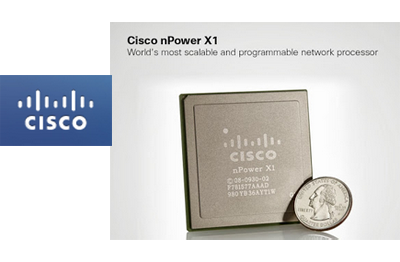 The multicore performance enables the device to power 10 Gbps routers and firewalls. The TILE-Gx9 is fabricated in a 40 nanometer technology. Its 3 x 3 array of three-issue, 64-bit cores are connected through Tilera’s patented iMesh on-chip network that supports an advanced virtual memory system. Each core includes 32 kilobytes (KB) of L1 I-cache, 32 KB of L1 D-cache and 256 KB L2 cache, with 2.3 megabytes L3 coherent cache across the device. 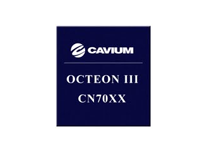 Maximum processor utilization is ensured with an on-board 72-bit DDR3 memory controller that supports up to 1600 Mt/s speeds and 64 GBytes total capacity. “We are seeing enormous market traction and design win activity with our 16 and 36-core TILE-Gx processors, unseating embedded processors and other difficult-to-program devices,” said Devesh Garg, president and CEO at Tilera. Broadcom has begun sampling its 28nm XLP 200-Series network processor for enterprise, service provider 4G/LTE, data center, cloud computing and software defined networking (SDN) equipment. The processor family, which is the world's first 28nm multicore communications processor family, promises up to 400 percent faster performance than competing solutions while lowering power consumption by up to 60 percent. Hardware Acceleration for packet ordering, network management, compression/decompression and RAID5/6 storage, etc. In September 2011, NetLogic first unveiled its XLP II family of processors based on 28nm process technology, packing up to 80 high-performance NXCPUs per chip, and promising 5-7x performance enhancement over the existing XLP processors. NetLogic said its XLP II processor family is designed to deliver over 100 Gbps of network processing performance per device and over 800 Gbps in a clustered, fully-coherent system. The devices integrate up to 80 high-performance NXCPUs per chip, featuring an enhanced quad-issue, quad-threaded, superscalar out-of-order processor architecture capable of operating at up to 2.5 GHz to provide unmatched control and data plane processing and low-power profile. NetLogic is adding innovations that improve pre-fetch performance, branch mis-predict penalties and cache access latencies. The family also significantly expands the tri-level cache architecture to over 32MB of fully coherent on-chip cache which represents over 260MB of on-chip cache in the maximum clustered configuration of 8 fully-coherent XLP II processors. NetLogic also introduced a second-generation high-speed Inter-chip Coherency Interface (ICI) that will enable systems designs with eight sockets of XLP II processors for scalability of up to 640 NXCPUs. Full processor and memory coherency are enabled across all 640 NXCPUs, allowing software applications to run in Symmetric Multi Processing (SMP) or Asymmetric Multi Processing (AMP) modes. Earlier this year, Broadcom acquire NetLogic Microsystems in a deal valued at $3.7 billion ($50 per share) net of cash assumed. NetLogic Microsystems, which was based in Santa Clara, California, added a number of critical new product lines and technologies to Broadcom's portfolio, including knowledge-based processors, multi-core embedded processors, and digital front-end processors. Broadcom announced its 100 Gbps full duplex network processor unit (NPU) aimed at the next wave of 100GbE optimized switches and routers for service provider networks. The new BCM88030 family features 64 custom processors running at 1GHz and eliminates the need for many external components. Power savings are estimated at up to 80 percent per 10GbE port. The architecture leverages extensive multi-threading and hardware acceleration for functions such as packet parsing, classification and look-ups. The BCM88030 family is completely user programmable, enabling a highly flexible forwarding implementations. The BCM88030 NPU family also includes a proprietary algorithmic look up engine using low cost DDR-3 DRAM that enables massive scale for Layer 2, IPv4 and IPv6 tables while significantly reducing system cost. Algorithmic on-chip access control list (ACL) capability is available along with seamless expansion using Broadcom's NL566xx knowledge based processor (KBP). The BCM88030 family consists of three devices, including the 100 Gbps BCM88038 NPU, the 50 Gbps BCM88034 NPU and the BCM88032 24 Gbps NPU. All devices are now sampling with production volume slated for the second half of 2012.